Magnum Chaos (c. 1524) is one of the intarsia of the choir of the Basilica di Santa Maria Maggiore in Bergamo. 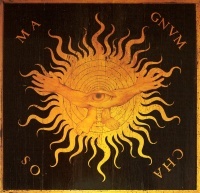 These were designed by Lorenzo Lotto and cut by Giovan Francesco Capoferri. The 'Magnum Chaos' intarsia is a representation of cosmogonical chaos. It depicts a sun with in its center an eye which has no body but two arms and hands and two legs and feet. The illustration (right) is depicted inverted, the original design is upside down to denote the falling through chaos, which happens in all directions, not just down. Unless indicated otherwise, the text in this article is either based on Wikipedia article "Magnum Chaos" or another language Wikipedia page thereof used under the terms of the GNU Free Documentation License; or on original research by Jahsonic and friends. See Art and Popular Culture's copyright notice. This page was last modified 14:10, 19 February 2014.